It was cold outside, and we wanted brunch. We headed over to Zelda Road to go to First Watch, a place that’s quickly risen to the top of our local list. We’d been there for a “take Mom to lunch” type of thing, and also had an early morning coffee there. The First Watch menu is extensive, even featuring calorie estimates for items, so you know what you’re getting into. On the previous visit for lunch, one of us did a soup and sandwich combo (tomato soup, grilled veggie sandwich, while the other of us tried the veggie burger. For this brunch visit, we were thinking about eggs. On each visit, the place has felt a little under-staffed. The folks that work there are attentive and accurate, but it always feels like they need one more person working the floor. 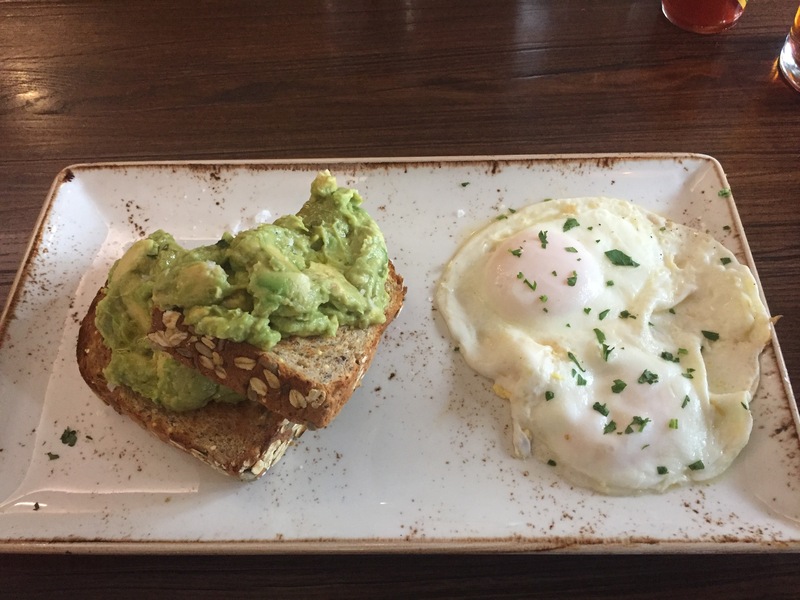 One of us got the avocado toast, and the other a “Market skillet.” Avocado toast gets a bad rap as a millennial kind of thing, more meme than food. But it turns out that this is a really delicious way to eat avocados, which are good for you. Avocado spreads perfectly over thick-sliced toast, a nice alternative to butter. This particular toast was piled high – the thick whole grain bread must have had a whole avocado on it. It was salted perfectly, and served with two eggs on the side. They were the perfect kind of over easy, and made a nice accompaniment to the toast. 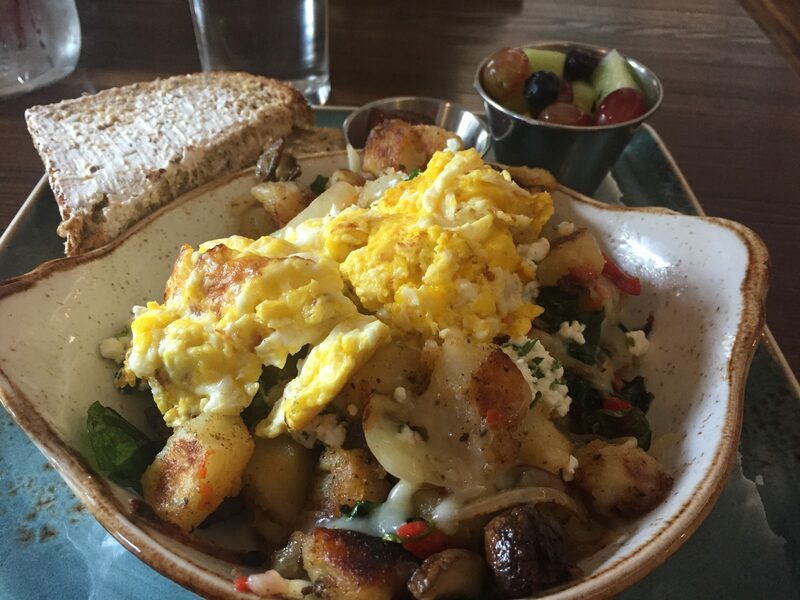 The skillet merged a few kinds of vegetables (mushrooms, potatoes, zucchini, red peppers, spinach) with goat cheese and mozzarella, topped with two eggs – scrambled, in our case. It’s vegetarian, but not exactly healthy. It was good comfort food in an ample portion, and was served with a side of toast. The chevre blended everything together nicely, and it was a solid offering. In the end, we got just what we wanted out of our late breakfast, and didn’t have to clean the kitchen or anything. Other menu items were also enticing. We almost went with some French toast, and the oatmeal was also enticing. A lot of the items are at least marketed as healthy-seeming. But there are also some pretty decadent menu selections, like cinnamon roll pancakes that are as much dessert as breakfast. 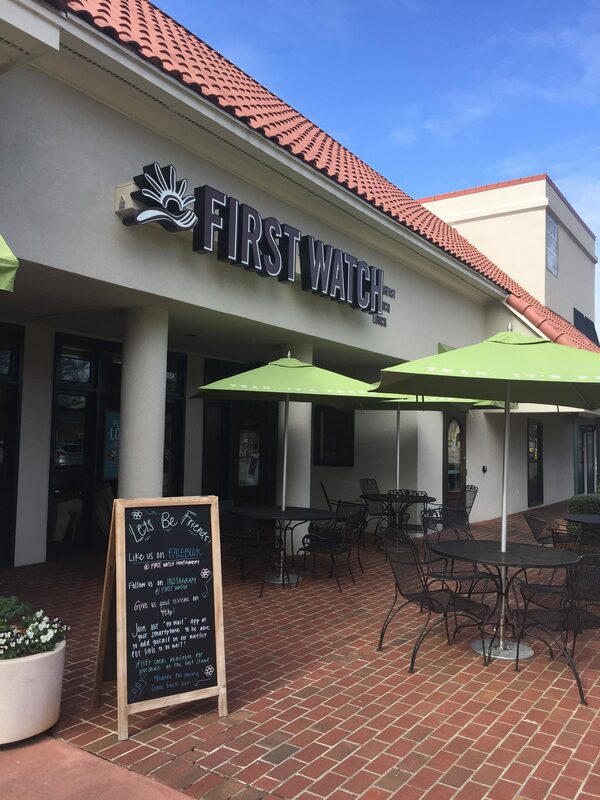 First Watch is a chain, but it manages to have a more local vibe about it, and if the crowds we’ve seen there are any indication, there’s a lot of demand for their “fresh fast” style of food. Which is nice, because brunch is one of the best meals of the day, and it’s good to know there’s a place where you can get some eggs and coffee … and even some avocado toast.